Six men who had journeyed up the river from Connecticut and Massachusetts to establish a settlement founded what was to become the First Congregational Church of Lebanon on February 25, 1768. From humble beginnings, the church, the first to be formed in Lebanon, has served the Upper Valley for more than 240 years. Church meetings were first held in a log schoolhouse and in homes of the settlers, but soon after the Reverend Isaiah Potter was called as minister in 1772, worship services were held in what is now known as Colburn Park. By the 1820's, three other denominations shared the town quarters and the Congregationalists decided it was time to have a building of their own. A Congregational Church Society was formed and plans were laid out for the present house of worship. A plot of land was purchased and Ammi B. Young, a local man who later achieved national prominence as an architect, was chosen as the designer and builder. 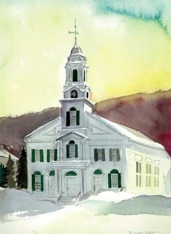 The new meetinghouse was dedicated on August 18, 1828. Its outward appearance today, except for additions at the rear, and a slight change to the tower made in 1881 to accommodate a 3,000-pound bell, is much the same as when built more than 180 years ago. Interior changes have been many. The building was originally heated by two wood-burning stoves at the rear, their long stovepipes extending over the heads of the congregation to the chimneys at the front of the sanctuary on each side of the pulpit The pews were the high-back variety with doors and partitions (These were replaced in 1871). Twentieth century additions and improvements include creation and renovation of a Sunday School (refurbished during the summer of 2010), offices, and a church parlor. The church's pipe organ was a memorial gift more than a hundred years ago and was pumped by hand. In 1957 this tracker action instrument was enlarged and electrified. A recent addition was an oboe stop. In 2008 the congregation purchased a Steinway baby grand piano to honor Richard and Nirmala Slater's 25 years of service to the church. The church has had 19 "settled pastors" during its 242 years, the longest term of service for any one pastor being that of "Priest Potter," the first pastor, who served from 1772 to 1817, a period of almost 45 years. Our current pastor is the Rev. Stephen R. Silver, who performed his first service on February 14, 2010.